French doors are a popular addition for homeowners who want to add a touch of European elegance into their homes. Their tall glass panels create a stunning design statement, providing charm as well as function. They combine the features of both a window and a door to stream light into the room, while giving easy access to the outdoors. 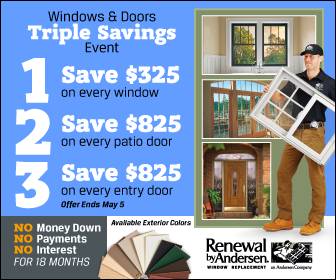 Let Renewal by Andersen® of St. Louis talk about the excellent features of our St. Louis French doors. Featuring wood and vinyl exteriors, you can rely on our French doors to protect your home from the harshest weather conditions. This combination makes them durable and resistant to outdoor elements. They are also easy to clean and maintain, which makes them a great low-upkeep option. Our French patio doors in St. Louis, MO, come in two configurations – hinged and sliding. The former is excellent for traditionally-styled homes for its classic appeal. You can open and close it by swinging the panes. They feature an expansive board stile and rail structure with mortise- and-tenon joints. You can choose from an array of colors and stains, including maple, oak, and pine, to add flair to your home. Our sliding French door, on the other h and, is ideal for modern homes. They slide open on track rollers to maximize space. They are integrated with a durable vinyl sheath for ease of maintenance. It also has a reach-out lock system to improve security. Our French hinged and sliding patio doors in St. Louis contain innovative components that work together to make your home cozier. One of them is our st andard High-Performance™ Low-E4® glass that reduces heat transfer from in and out of your home. This lessens your dependence on air conditioning, which leads to higher energy savings. It can also block harmful UV rays to prevent damage on your furniture. In addition, they can be used for daylighting and capturing the outdoor view. Enhance your home’s style and comfort with Renewal by Andersen French doors. To get started on your replacement project, call us at (314) 332-2364.